One of the biggest hurdles scooter manufacturers in the post-war years had to overcome, was prejudice from motorcycle owners and manufacturers. But if they were going to survive in a tough market, they couldn’t hide in the shadows. Something had to be done. Fighting fire with fire, taking on the establishment in top speed events soon became the norm for the new kids on the block when proving the worth of their scooters. 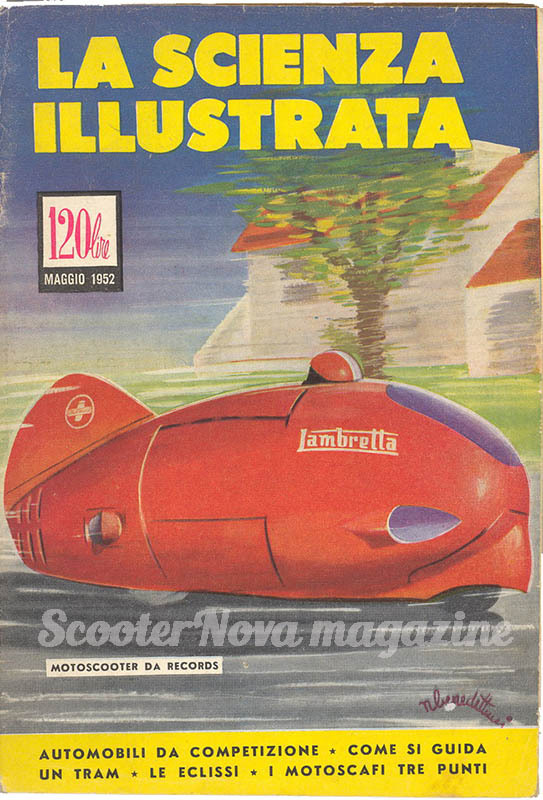 During the late 1940s and early 1950s, Piaggio and Innocenti pitted their Vespa and Lambretta scooters respectively against the likes of Mondial, MV Agusta and others to show the world that their new scooters were no slouches. A pair of Vespa racing scooters on display at the Piaggio Museum, Pontedera, Italy. Of course there was great rivalry between Lambretta and Vespa, who had each other to beat as well as win over world-wide opinion. In 1951, Dino Mazzoncini rode the factory Vespa Siluro (Italian for torpedo) to a top speed of 172.12kmh (almost 107mph) on a closed section of Italian motorway to claim the new 125cc world record. Innocenti retaliated soon after with their rider Romolo Ferri achieving an amazing 201kmh (121mph) in their Lambretta Siluro later in 1951, on a closed section of German autobahn between Munich and Ingolstadt. Shortly afterwards a rider was killed during a further record attempt by a motorcycle manufacturer and so an unofficial ceasefire was called in the top speed arms race. The Siluro on display at Rimini Lambretta Centre. The Lambretta Siluro at Goodwood in 2017 (photo by James Kemmenoe, courtesy of Matteo Panini). The story of ‘what happened next’ to the Lambretta Siluros (there were two built) is almost a book on its own. Following the closure of the scooter factory and the dissolving of the Innocenti family firm, one ended up in the Museum of Science in Milan, and the other eventually into the safe hands of the Panini family, they of ‘football stickers’ fame. A few years ago the Panini family allowed their Lambretta Siluro to be displayed at Rimini Lambretta Centre and subsequently the chaps at RLC brought it over to the UK to display at the Bridling Scooter Trade & Custom Show. As a result of the care they afforded this priceless classic, when Panini were invited to take the Lambretta Siluro for a lap or two of the Goodwood circuit earlier this year in celebration of 70 years since the first Lambretta was produced, it was RLC they entrusted to get it up and running again. Anyone who has undertaken the restoration of a classic vehicle will know how had that can be. Now imagine trying to work on a completely unique machine, with no manual, no notes, and not even a stock engine or components to begin with! Of course if you saw it running at Goodwood you’ll know the project was success, but if you want to know more about the recommissioning work, then you’ll find an exclusive article all about it in edition 4 of ScooterNova magazine. As well as the five-page article on the Siluro, we have some exclusive, never seen before photographs from the Innocenti archives as part of our ’70 years of Lambretta’ article, courtesy of Vittorio Tessera, which include production line photos, factory images and outtakes from promotional shoots. That’s along with a vast range other interesting scooter features including Vespas and Durkopps, rustos and customs, touring and tuning, and a whole load more. To buy the latest edition of ScooterNova magazine online, direct from the publishers click here. You’ll also find subscriptions there too. If you’d like to purchase a copy from your local scooter shop, a list of stockists can be found here. Back issues are also available, while stocks last. This entry was posted in 1950s, Lambretta, Scooter Event, scooter racing and tagged 201, 201kmh, festival of speed, fos, goodwood, kmph, lambretta streamliner, magazine, maserati, panini, revivial, Rimini Lambretta Centre, romolo ferri, scene, scootering, scooterist, scooternova, Siluro, Vespa by admin. Bookmark the permalink. Glad you like it Steve, and well pushed on the Siluro!! ???? Oh yeah, we pushed for all Lambrettisti ! A real privilege. James has many more fantastic photo’s.